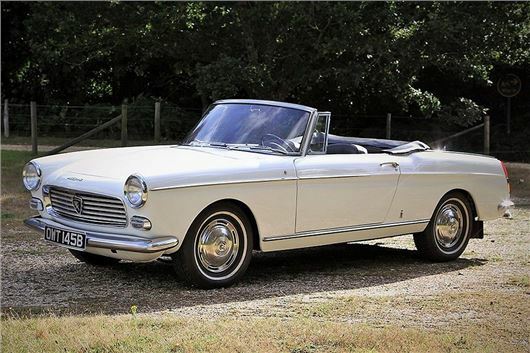 This lovely rare 1964 Peugeot 404 Pininfarina cabriolet features in Historics 24th November classic car auction at Mercedes Benz World, Brooklands. Along with a top class 1963 Lancia Flaminia 3B Pininfarina coupe, stunning a 1959 Lancia Flaminia GT by Touring and an outstanding 1964 Alfa Romeo 2600 spider. The Peugeot 404 Cabriolet shared no external panels with the 404 saloon, giving Pininfarina the freedom to create a classic convertible with styling similar to the Ferrari 250GT Lusso. This 404 cabrio, from Sweden, is the fuel injected version so is decently quick and comes with a UK V5C together with the Swedish registration certificate. It is estimated at £27,000 to £32,000, befitting the scarcity of the model and the quality of this car. With similar Battista Pininfarina styling to the Peugeot 404 cabrio, this 1963 Lancia Flaminia 3B 2.8 is the desirable later 136HP version, first registered in Rome having spent most of its life in Sicily. Consequently, it is all original, never welded and shows a lovely patina. Engine, transaxle gearbox and chassis numbers all match and have been confirmed as original via Lancia Classiche, with a certificate in the history file. It is estimated at £23,000 to £26,000. Another Lancia Flaminia GT, this time a 1959 with exquisite handcrafted aluminium coachwork by Touring of Milan was an extremely expensive car in its time. This example has been in the current ownership for the past four years. Originally supplied to Libya as a 2500cc GT in 1959, it was imported into the UK in August 1970. Restored by Lancia specialists, Omicron, the paint work in Lord-Blue, is complemented by its striking red interior. A 2.8 litre engine rebuilt by Brian Randall Engineering replaced the original 2.5. Further works have included triple Weber carburettors, rebuilt by Omicron, new brake callipers, brake servo, clutch and a re-upholstered interior. This exclusive Lancia is estimated at £95,000 to £120,000. Completing an Italian foursome, this Alfa Romeo 2600 Spider by Touring of Milan is a rare ‘Tipo 106.08’ with right hand drive supplied new to Roy Salvadori’s dealership in June 1964. Another superb matching numbers car, its detailed restoration is fully documented, it comes with its original tool kit and an Alfa Romeo Classiche certificate. Probably the best Alfa Romeo 2600 Spider in the World it is estimated at £115,000 to £130,000. Viewings for the sale at Mercedes Benz World on Thursday 22nd from 10am to 8pm and Friday 23rd from 10am to 5pm. The sale commences at 10.am on Saturday 24th November. Too bad BMC did not go this route and produce an MG Farina coupe based on the Farina Magnette: 1.8L MGB motor with 4 speed / overdrive.